For other uses, see Algeciras (disambiguation). Algeciras (/ˌældʒɪˈsɪrəs/; Spanish: [alxeˈθiɾas]; Arabic: الجزيرة الخضراء‎, translit. Al Jazīra Al-Khadrā) is a port city in the south of Spain, and is the largest city on the Bay of Gibraltar (in Spanish, the Bahía de Algeciras). The Port of Algeciras is one of the largest ports in Europe and the world in three categories: container, cargo and transhipment. It is located 20 km north-east of Tarifa on the Río de la Miel, which is the southernmost river of the Iberian peninsula and continental Europe. In 2015, it had a population of 118,920. 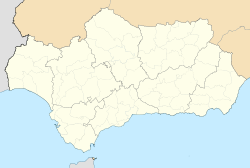 It is the biggest city among those of its metropolitan area that also includes the municipalities of Los Barrios, La Línea de la Concepción, Castellar de la Frontera, Jimena de la Frontera, San Roque and Tarifa, with a population of 263,739. The site of Roman cities called Portus Albus, Caetaria (current Getares) and Iuliua Tracta, the current name of Algeciras comes from the Arab period of the Iberian Peninsula: Al-Jazīra Al-Khadrā' Arabic الجزيرة الخضراء or Green Island. However, in modern dialectical Arabic it is referred to as Al Khuzurat in neighboring Morocco. The area of the city has been populated since prehistory, and the earliest remains belong to Neanderthal populations from the Paleolithic era. Due to its strategic position it was an important port under the Phoenicians, and was the site of the relevant Roman port of Portus Albus ("White Port"), with two nearby cities called Caetaria (most likely Iberians) and Iulia Transducta, founded by the Romans. Recently it has been proposed that the site of Iulia Transducta was the Villa Vieja of Algeciras. After being destroyed by the Goths and their Vandal allies, the city was founded again in April 711 by the invading Moors, as the first city created by the Amazigh (Berbers) on the occupied Spanish soil. In the year 859 AD Viking troops on board 62 drekars and commanded by the leaders Hastein and Björn Ironside besieged the city for three days and subsequently laid waste to much of it. After looting the houses of the rich, they burnt the Aljama mosque and the Banderas mosque. Reorganized near the medina, the inhabitants managed to recover the city and make the invaders run away, capturing two boats. It enjoyed a brief period of independence as a taifa state from 1035 to 1058. It was named al-Jazirah al-Khadra' ("Green Island") after the offshore Isla Verde; the modern name is derived from this original Arabic name (compare also Algiers and Al Jazeera). In 1055 Emir Al-Mutadid of Seville drove the Berbers from Algeciras, claiming it for Arabs. In 1278, Algeciras was besieged by the forces of the Kingdom of Castile under the command of Alfonso X of Castile and his son, Sancho IV. This siege was the first of a series of attempts to take the city and ended in failure for the Castilian forces. An armada sent by Castile was also annihilated whilst trying to blockade the city's harbor. Statue in Algeciras of King Alfonso XI of Castille, who conquered the city in 1344. After many centuries of Muslim rule, the tide of the reconquista arrived at Algeciras. In July 1309 Ferdinand IV of Castile laid siege to Algeciras as well as Gibraltar. The latter fell into Christian hands, but Muslim Algeciras held on for the following three decades, until Alfonso XI of Castile resumed its siege. Juan Nunez de Lara, Juan Manuel, Pedro Fernández de Castro, Juan Alfonso de la Cerda, lord of Gibraleón all participated in the siege, as did knights from France, England and Germany, and even King Philip III of Navarre, king consort of Navarra, who came accompanied by 100 horsemen and 300 infantry. In March 1344, after several years of siege, Algeciras surrendered. On winning the city, Alfonso XI made it the seat of a new diocese, established by Pope Clement VI's bull Gaudemus et exultamus of 30 April 1344, and entrusted to the governance of the bishop of Cadiz. The bishops of Cadiz continued to hold the title of Aliezira, as it called, until 1851, when in accordance with a concordat between Spain and the Holy See its territory was incorporated into the diocese of Cadiz. No longer a residential bishopric, Aliezira is today listed by the Catholic Church as a titular see. The city was retaken by the Moors in 1368. It was destroyed on the orders of Muhammed V of Granada. The site was subsequently abandoned, but was refounded in 1704 by refugees from Gibraltar following the territory's capture by Anglo-Dutch forces in the War of the Spanish Succession. It was fortified to guard against British raids with installations such as the Fuerte de Isla Verde built to guard key points. the city was rebuilt on its present rectangular plan by Charles III of Spain in 1760. In July 1801, the French and Spanish navies fought the British Royal Navy offshore in the Battle of Algeciras, which ended in a British victory. The city became the scene for settling a major international crisis as it hosted the Algeciras Conference in 1906. The international forum to discuss the future of Morocco which was held in the Casa Consistorial (town hall). It confirmed the independence of Morocco against threats from Germany, and gave France control of banking and police interests. In July 1942 Italian frogmen set up in a secret base in the Italian tanker Olterra, which was interned in Algeciras, in order to attack shipping in Gibraltar. During the Franco era, Algeciras underwent substantial industrial development, creating many new jobs for the local workers made unemployed when the border between Gibraltar and Spain was sealed by Franco between 1969 and 1982. In 1982 there was a failed plan codenamed Operation Algeciras conceived by the Argentinian military to sabotage the British military facilities in Gibraltar during the Falklands War. The Spanish authorities intervened just before the attack, and deported the two Argentine Montoneros and military liaison officer involved. Algeciras is principally a transport hub and industrial city. Its main activities are connected with the port, which serves as the main embarkation point between Spain and Tangier and other ports in Morocco as well as the Canary Islands and the Spanish enclaves of Ceuta and Melilla. It is ranked as the 16th busiest port in the world. The city also has a substantial fishing industry and exports a range of agricultural products from the surrounding area, including cereals, tobacco and farm animals. In recent years it has become a significant tourist destination, with popular day trips to Tarifa to see bird migrations; to Gibraltar to see the territory's sights and culture; and to the Bay of Gibraltar on whale watching excursions. Algeciras is the southern terminus of two principal north-south Euroroutes, the E05 and E15. Both routes, moreover, run to Scotland (the E05 terminates at Greenock and the E15 at Inverness) via France and England. Algeciras has a subtropical climate with very mild, rainy winters and warm, dry summers with occasional heat waves, and temperature fluctuations are small because of the strong Oceanic influence. There aren't snow registers in the city since the 19th century. The bus urban transport in managed by C.T.M. (Cooperativa de transporte de Marruecos). The Algeciras Gibraltar Railway Company built the Algeciras-Bobadilla railway line, which connects to Bobadilla, Antequera and continues to the rest of Spain, the train line terminates near the port of Algeciras. The main bus station is located next to the train station. Several bus companies operate intercity bus services from and to Algeciras. Gibraltar Airport – to 20 km. Jerez Airport – to 100 km. Málaga Airport – to 120 km. In addition, the Algeciras Heliport is being built for transport to Ceuta and other areas in the region. Elaborate bench in Plaza Alta. Hospital de La Caridad, (1748). Art School Building. (1971) architect: Fernando Garrido Gutiérrez. District de San Isidro, typical district designed in the twentieth century. Arrastre de latas (5, January). Feria Real de Algeciras (June). Fiestas patronales en honor de Ntra. Sra. la Virgen de la Palma (August). Fiesta de los Tosantos (1, November). Algeciras CF at the Estadio Nuevo Mirador. Algeciras CF, founded in 1912, played in the third-tier Segunda División B in 2013–14 season and relegated to Tercera Division, fourth level of Spanish league after losing play-out, holding home games at the Estadio Nuevo Mirador. Algeciras BM was played in Liga ASOBAL between 2005 and 2008. The team was dissolved due to enormous debts after relegation to second level in 2008. Escuela Universitaria de Estudios Jurídicos y Económicos del Campo de Gibraltar "Francisco Tomás y Valiente"
Escuela Universitaria de Magisterio "Virgen de Europa"
^ "Population of Algeciras, AND, Spain". quandl.com. Retrieved 26 March 2016. ^ a b O'Shea, Henry George (1865). A Guide to Spain. Longmans, Green. p. 91. Retrieved 23 August 2012. ^ Gozalbes Cravioto, Enrique (2001a). "La supuesta ubicación de Iulia Traducta en Tarifa". Aljaranda (in Spanish) (21). Archived from the original on 2009-06-10. Retrieved 2013-03-20. ^ Mrabet, Abellatif; Rodriguez, José Remesal (2007). In Africa et in Hispania: études sur l'huile africaine (in French). Edicions Universitat Barcelona. p. 191. ISBN 978-84-475-3257-5. Retrieved 2013-03-19. ^ Livermore, Harold (1 October 2006). The Twilight of the Goths: The Rise and Fall of the Kingdom of Toledo C.575–711. Intellect Books. p. 101. ISBN 978-1-84150-966-2. Retrieved 23 August 2012. ^ a b Rogers, Clifford (21 June 2010). The Oxford Encyclopedia of Medieval Warfare and Military Technology. Oxford University Press. p. 33 and 209. ISBN 978-0-19-533403-6. Retrieved 23 August 2012. ^ Chaucer, Geoffrey; Andrew, Malcolm (1993). The General Prologue. University of Oklahoma Press. p. 67. ISBN 978-0-8061-2552-7. Retrieved 23 August 2012. ^ Musteen, Jason R. (15 October 2011). Nelson's Refuge: Gibraltar in the Age of Napoleon. Naval Institute Press. p. 43. ISBN 978-1-61251-084-2. Retrieved 23 August 2012. ^ Olson, James Stuart; Shadle, Robert (1991). Historical Dictionary of European Imperialism. Greenwood Publishing Group. p. 8. ISBN 978-0-313-26257-9. ^ Hammond, Eleanor; Hughes, Wade (7 April 2012). The Judas Reef. D Books. p. 12. ISBN 978-1-74335-009-6. Retrieved 23 August 2012. ^ Tremlett, Giles (24 July 2004). "Falklands war nearly spread to Gibraltar". The Guardian. Retrieved 23 August 2012. ^ "The Weather Channel – Monthly Averages for Algeciras, Spain". Algeciras. Encyclopædia Britannica Online, 2006. Wikivoyage has a travel guide for Algeciras. Wikimedia Commons has media related to Algeciras.